Meet all the girls at Swimmer’s Lane. 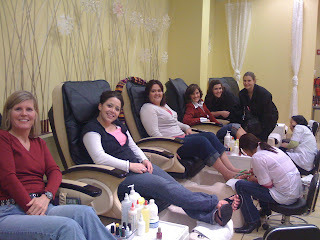 They seem to enjoy themselves with all their toes all prettied-up for Christmas. Thank you, ladies….for sharing your holidays spirit with us. 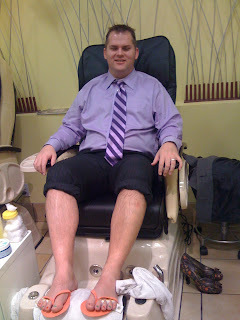 This is Dan….all relaxed and happy right after his first pedicure! 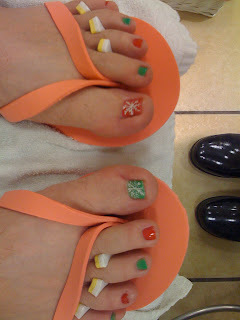 Check out Dan’s Xmas toes…. I”m sure his significant other will appreciate the snowflakes. OMG!!!! Where all the times had gone????? I can’t believe I last updated the blog in October! I’m still waiting to hear back from the State my “prompt” hearing. Nothing!!! I’ve tried to call them a couple of times……………So stay tuned. I’m really trying. I know many of you been waiting to anxiously for the fish to come back but……. Be patient with me! Just know that I’m working on it!